Please Choose Your Box Spring Depth (Height) Mattress Depth 5" Mattress Depth 6" Mattress Depth 7" Mattress Depth 8" Mattress Depth 9" Mattress Depth 10" Mattress Depth 11" Mattress Depth 12" Mattress Depth 13" Mattress Depth 14"
Twin size is approximately 39" wide by 75" long. All other sizes are available. Completely protect your bed including your mattress, box spring and pillow from bedbugs! As a bonus, our covers will also seal out allergens and dust mites. SHIPPING TIME: 95% of our orders ship within 10-15 business days, plus a few days transit. 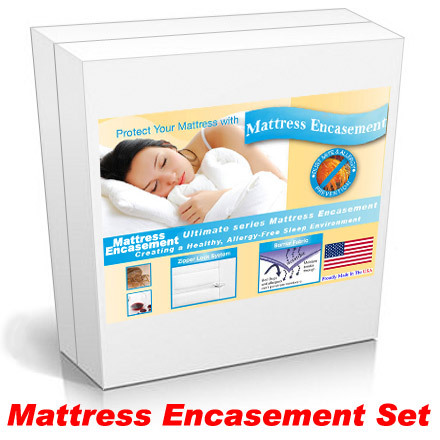 This Mattress Encasement Kit will actually encase and enclose the mattress and box spring fully, protecting the mattress and box spring from bed bug infestation. For your privacy, we ship in a plain unmarked carton. The unique breathable membrane in this product makes sure that no fluids or stains make their way onto your mattress. Bed Bugs or Cimex lectularius are becoming an epidemic, again! 100% dust mite and allergy protection. Stretch Knit surface is absorbent, 100% waterproof and also breathable like the human skin. Cool and totally quiet sleeping surface unlike plastic based product that rustle under the sheets. Our Bed Bug Mattress Cover is classified as a class 1 medical device by the FDA. Certified by an Entomology Laboratory to be bed bug bite proof. Superior protection against bed wetting. Protects against allergens such as pet dander and pollen. Machine washable in hot water which aids in removing any residual allergen build up. Breathable, absorbent, stain proof and waterproof. Also available in pillow protectors. To add these to your order please choose this option from the drop down menu. Since the government ban of DDT, which was used to eradicate this pest in the 1980's, bed bugs have run rampant. Our unique bed bug mattress cover fabric has been lab tested to be bed bug bite proof and bed bug entry proof. Our exclusive zipper lock system combined with the impermeable fabric creates a block to bed bugs getting in or out of your mattress. Our zippered mattress protector gives you complete mattress protection for a healthy, allergy-free sleep zone. It is bed bug proof. Our cover completely encases your mattress or box spring and gives you total protection against dust mites, allergens and bed bugs. Our mattress protector is completely bed bug bite, entry and escape proof. Bed bugs can crawl through the smallest spaces, looking for a meal. It is very difficult to stop them, but our mattress protector is PROVEN to stop bed bugs! Completely Encases the mattress to insure dust mite and bed bug protection. Protects mattress against spills but still lets the mattress breathe. Not plastic based so it is not noisy and does not rustle. Machine Washable in hot water. Pillow protectors are available from the same material. Our Bed Bug Mattress Cover encasement provides your whole family with a clean and healthy sleeping environment. The smooth surface is waterproof and stain proof, but still breathes. Liquids and stains stay out, yet our state-of-the-art mattress protector remains breathable and comfortable. This Bed Bug Mattress Cover is good for one mattress or one box foundation or box spring. Please select your mattress depth (height) from the drop down menu. If you wish to protect both the mattress and box spring, you will need to order two encasements, one for each. For optimal protection you need to cover both the mattress and the box spring. Dust Mites & Your Health! Uncovered mattresses are the perfect breeding ground for dust mites which can cause allergies, asthma, eczema and rhinitis. Dust mites live on the millions of skin cells and body fluids that humans shed every night. 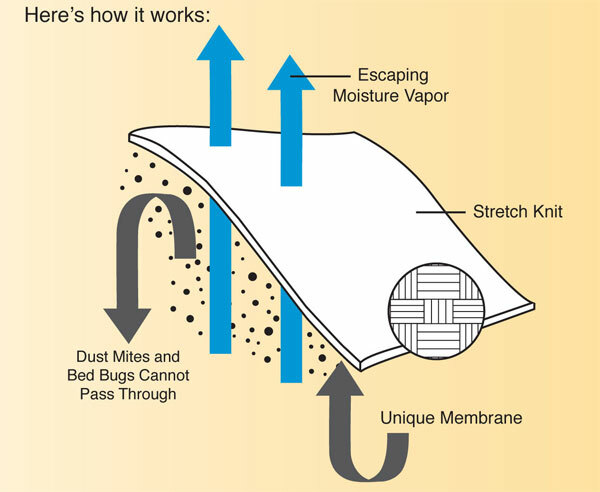 By encasing your mattress with a Bed Bug Mattress Cover, you will seal in any dust mite build up currently residing in your mattress and prevent any new allergens from forming. Fitted sheet style mattress protectors only protect 25% of your mattress ultimately leaving the mattress exposed to harmful allergens. Do you have allergies? You spend over one third of your life in bed. One of the allergic hot spots for you is your mattress. Billions of dust mites live on your mattress. Their droppings (yes they poop!) are all over your nice clean looking mattress. Just because you keep a clean quilted mattress pad and clean sheets on your mattress, you are not protecting yourself from these powerful, dirty allergens. Every time you roll over, a microscopic storm of dried dust mite feces, body parts, etc., explode in your sleeping area. Our Bed Bug Mattress Cover encasements are designed to stop this problem. Sleep healthy and get protection now! Twin Mattress Encasement Kit For Mattress, Box Spring, and Standard Size Pillow. 100% allergy and dust mite protection. Sewn in the USA.